The European Parliament has decided to draw up a report on whether EU laws and values are respected in Hungary, after Budapest passed controversial state reforms that are widely seen as undemocratic. MEPs will later decide whether to activate Article 7 of the EU Treaty, which is used to investigate breaches of EU values. The resolution – tabled by centre-left and left political groups – was approved 315-263 with 49 abstentions. It drew strong criticism from the centre-right European People's Party to which the Fidesz party of Hungarian Prime Minister Viktor Orbán is affiliated. The four-page resolution calls on the European Commission to closely monitor the changes to some of Hungary's basic laws and how it puts them into practice. MEPs have called on the Conference of Presidents – the leaders of the Parliament and its political groups – to consider activating Article 7 of the Lisbon Treaty, which is used in the event of a clear risk of a serious breach of EU common values. Belgian MEP Guy Verhofstadt, who heads the Alliance of Liberals and Democrats for Europe, was the first to call for making use of Article 7 in the case of Hungary. [More on the content of the resolution]. The resolution was backed by ALDE, along with the Socialists and Democrats, the Greens/European Free Alliance and the European United Left. The European Commission on 17 January began infringement procedures against Hungary, focusing on concerns about the independence of the central bank and data protection authority, as well as the lowering of the mandatory retirement age of judges from 70 to 62 years. The Commission also asked the Hungarian authorities for further information on the judiciary and whether recent changes in law compromised its independence. The Hungarian government was given one month to respond, with the deadline expiring today (17 February). Recently, Hungarian representatives said that the country would accept most revisions demanded by the Commission, even where it considers the EU executive to be wrong. The EPP group blasted the sponsors of the resolution for "making a judgement before the end of the process". "This is the authoritarian method. This is the method which is against European values," declared MEP Kinga Gál (Hungary). Simon Busuttil of Malta said the resolution "undermines the Hungarian people's trust in the EU and the credibility of the European Parliament". "These actions nourish the emergence of political extremism and Euro-scepticism. This is against the interest of the EU as a whole," Busuttil stated. The debate and vote took place after Commission Vice President Neelie Kroes made controversial statements at a recent hearing in Parliament on the situation in Hungary. The Digital Agenda commissioner quoted an unnamed colleague as stating that discrimination against ethnic minorities was rife in Hungary and getting worse. Minority groups were discriminated against when they sought employment, police were under instruction to monitor them, and racism in schools was becoming more open and more accepted, Kroes said, adding that some ethnic groups were living in fear of violent attacks. Hungarian MEP Lívia Járóka (EPP) said she was shocked to hear "such pernicious allusions from the second highest ranking official of the EU without even the slightest attempt to prove them with facts and reliable data". "By adopting a condemning resolution on Hungary, the Socialist, Liberal, Green and Communist Groups of the European Parliament are neglecting the fact that there is an ongoing dialogue between the Hungarian Government and the European Commission. "These Groups have already made their judgement before the end of this process. This is the authoritarian method. This is the method which is against European values. With the adoption of this premature and groundless Resolution, the Left and Liberal parties of the EP are undermining Hungarian people's trust in the European Union and the credibility of the European Parliament." Belgium's Guy Verhofstadt, the ALDE leaders, said: "Today the European Parliament confirmed its commitment to fighting any violation by a member state or government, such as the Orbán government, against our common European values of freedom and democracy. This is a vote in defence of the Hungarian citizens, and those across the EU that face similar threats to their liberty and checks and balances of the democratic system. "In a clear condemnation of the government of Viktor Orbán, a European Parliamentary majority today denounced threats in Hungary to democracy, the rule of law, media freedom, the independence of the judiciary, and respect for and protection of human and social rights." Renate Weber of Romania, the ALDE coordinator in the civil liberties committee, said that Article 7 of the Lisbon Treaty allows, in case of "clear risk", to send a warning signal before the risk materialises. "The risk in Hungary has already and clearly materialised," Weber said. 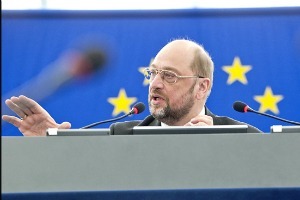 "Apart from some issues already tackled by the Commission under infringement proceedings that confirm it, still many others remain unaddressed, such as freedom and pluralism of the media, the rights of political opposition, the law on churches and religious, the law on the criminalisation of homeless persons, just to mention a few. That is why, with today's resolution, the majority in the EP agreed to prepare a report to monitor developments in Hungary, and possibly pursue further actions under Article 7.1 TEU should the government not change direction". "I wanted this text to be stronger in denouncing a range of discriminatory provisions, such as the persecution of homosexuals in Hungary. The resolution also does not address the new education laws that pose a real threat to the diversity of education and equality of access. The European Commission has been conspicuous by its slowness in the implementation procedures. This should have also been clearly criticised by Parliament's resolution," Vergiat said. Amnesty International issued a statement in support of the vote. "We warmly welcome the fact that the European Parliament is considering whether to activate the Article 7 mechanism to investigate the risk of a serious breach of human rights by Hungary. We hope this move will set a precedent and lead to better protection of fundamental rights throughout the EU," said Nicolas Beger, director of Amnesty International’s European Institutions Office. The EU has imposed sanctions only once against a member state. In 2000, 14 countries of the then 15-member EU reacted to the entrance of Jörg Haider's far-right Austrian Freedom Party into the Austrian government by freezing bilateral relations with the country. No contacts or ambassadorial meetings at an intergovernmental level were held and Austrian candidates were not supported when EU international offices were assigned. The sanctions were imposed in February 2000 and lifted seven months later when Haider stepped aside as party leader. He died in a car accident in 2008. France, Belgium and Germany led the campaign to ostracise Vienna. This was seen largely to result from domestic political sensitivities to the far right. Then-President Jacques Chirac of France sought to oppose the country's Front National and Belgium faced pressure from the separatist Vlaams Blok. By contrast, Italy and Denmark urged for the lifting of sanctions. Dnevnik, the EURACTIV partner in Bulgaria?????????????? ???????? ??????? ?? ?????? ?????????? ?? ?? When is the Parliament going to place Wolfgang Schauble under scrutiny, in light of his explicit call for the end of democracy in Greece? @Hoover: can you please quote that explicit (sic) call by W. Schauble to end democracy in Greece? In your dreams perhaps? WHICH of you have traveled to Hungary and some of it’s smallest towns on an annual basis to see the quality of life of the people living there? My sister moved to Hungary from the US 16 years ago, and let me tell you how hard life is there!! Almost every year for the last 30 years I’ve spent my vacation in Hungary visiting family. LIFE there is very difficult! It’s deteriorated over the last 10 years! My sister owned her own bakery, and she had to sell it as people were reluctant to BUY BREAD!! The PREVIOUS government sucked the people dry! Can you live off $400/month? That is what the hourly workers are getting payed! The prices in Budapest of fruits and vegetables in the market is what we pay here in the US! US salaries are easily > 4x that of the Hungarians! How do you expect them to live – when paying EU prices – while trying to join the EU with NON EU salaries??? The previous government was PINK – Puppets that were elected in and communist from the previous Russian government’s people. They did nothing for the people, only for themselves. HOW CAN YOU JUDGE THE PEOPLE FOR WANTING A CHANGE?? Wouldn’t you? There is NOTHING wrong with wanting to have the term God in your constitution! THE HUNGARIANS were NOT allowed to GO TO CHURCH or PRAY or anything for all the 45 YEARS the COMMIES Sat on them!! My grandma had to go to church in secret and also was not allowed to get a job. IT IS AMAZING that Hungary survived what they did! THEY ARE THE MOST WESTERN of ALL THE EAST BLOCK COUNTRIES because they stood up for their FREEDOM and RIGHTS in 1956! THE result was that they got hammered by the Russian tanks while the rest of the world just stood by and watched! Why don’t we leave them alone now too? THE current government is allowing people to reclaim their Hungarian citizenship. That is great for all those who had to FLEE in 1956 or be executed because they stood up and fought for their freedom. I consider this PROGRESSIVE! All the Hungarians who have been persecuted because they were “lopped-off” of Hungary and given to Austria, Czechoslovakia, Russia, Romania, Yugoslavia, etc as part of the WW1 Trianon Dictate can also apply for Hungarian citizenship. Did you know there there is still Human rights violations in the countries adjoining Hungary TODAY? Yes, they harass and beat up / kill a fellow country man because they speak Hungarian! This does not happen in Hungary! There are still German/Slovak/Romanian/Szerb schools within Hungary still teaching in their native language. Can you believe the EU will NOT allow the Head of the Hungarian National Bank to pledge allegiance to the Hungarian Constitution? CRAZY! Hungary has had their own constitution for 1000 years, until 1949 when under the Soviet directive it was required to set-up a NEW STALIN-ic constitution!! The present government got 2/3 majority in the parliament to restore their “ancient” constitution. NOW THIS IS FREEDOM! RIGHT?? THE EU Parlament is a RACIST COLONIAL SYSTEM & should get their facts straight!! GO VISIT HUNGARY and see how friendly and hard working the people are!